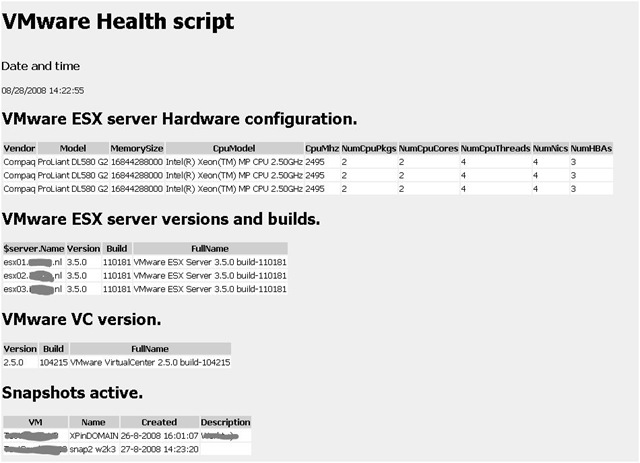 Healthcheck is a Powershell script that reports information like snapshots, VMware tools version, datastore space, CDROM and/or floppy drives connected etc. to HTML and e-mail the output to a person or distribution list. – Snapshots are enabled and forgot the commit to the VM. In the Virtual Infrastructure Client (VIC) it is difficult to see this sort of information. By creating a Powershell script, I can do a quick inventory. In a lot of VMware environments I created a scheduled tasks, so the script runs once a week and sent to HTML rapport to the administrator. 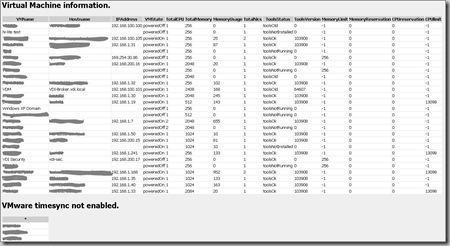 – VirtualMachine (VM) information like VMware tools version, CPU, Memory reservations and limits etc. 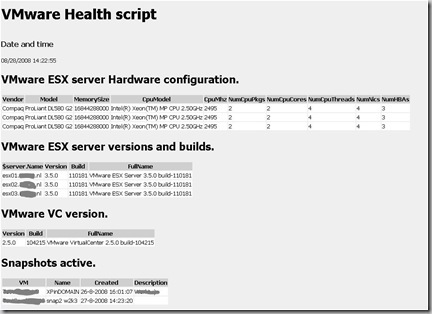 – Unzip the Healthcheck.zip script to a directory on the VC server for example. Very nice script. Love the detail. Very nice work. I have found this script to be very usefull. I have a couple of suggestions. 1) Change the CSS to be part of the HTM file so that is it not dependent on the style.css file. This will make it so that the report maintains the style even when e-mailed. Well, looks like the blogging engine stripped out the style tags on suggetion 1, but you get the point. Thanks for the suggestions Curtis! Would you mind sharing your version of this script with the CSS stuff built in? I am very interested in that. After a bit of trial and error. Find the two ConvertTo-Html lines and replace them with this! Very very nice, great work! 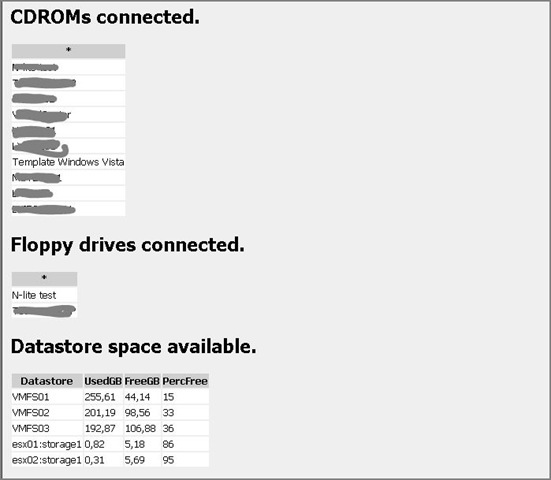 I suggest the following enhancement to see the size of each windows disk in a VM, space used, space free and percent free (not just percfree). I however did not sort by percent free as it’s sorted by VM, up to you! I used some new variables which are also listed. Please share the script once you incorporate the items mentioned in “Future”. Could you please send me the “embedded css” script? 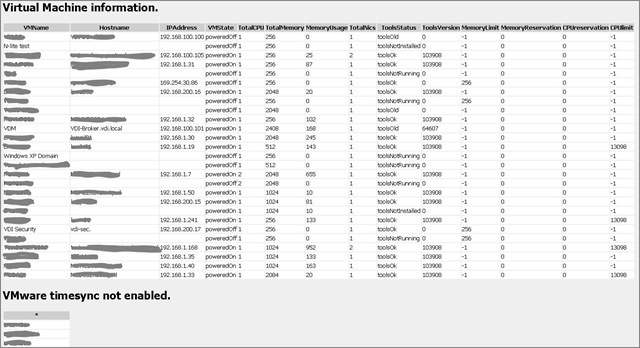 I’ve scheduled this script as a scheduled task with a service account with administrator rol in VC (Datacenter level). Worked perfect untill we upgraded to VC2.5U4. Also the VI Toolkit got updated, maybe this is the reason? Can you pleasae send me the update script with the ambedded CSS code as well? This is a amazing script . It helped my 2 weeks work .. !! Can you send me the updated script? Hey there, I haven’t checked the source of your powershell script out yet, but is this still compatible with vSphere? Are there any cmdlets run that could potentially modify the VC database? Or is everything in this just to retrieve info? Trying to figure out whether this would be safe to run against our vCenter environment now…. How to have the final html report i.e., $filelocation to be displayed as a body of the mail message. This is very helpful, I didn’t have any issues trying to implement this in our datacenter. Hi, This is very useful script, Can anyone send me the update script with the ambedded CSS code as well on hemant_patel@symantec.com. I tried to change in existing script but didnt work for me in emailed report. I have some issues when I run the script twice. The report on VM information adds on to the list which has some errors. Anyone has any errors similar? Is there an updated script for this? Appreciated it. 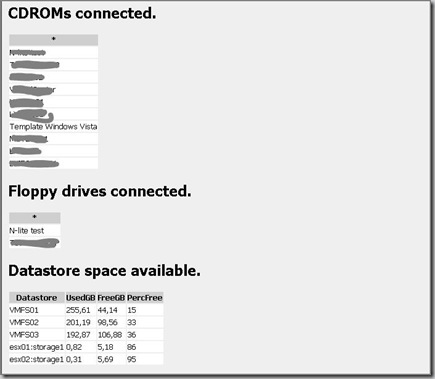 1. where is the Powershell.ps1 file location? 2. where and How to put vcenter usernama and password ? We are sorry, but access to this place or content is restricted. If you believe this message to be in error, please contact the system administrator at community_mgr@vmware.com or the person who directed you here. I am getting below error while executing the script. Add-PSsnapin : No snap-ins have been registered for Windows PowerShell version 5. And when script finished it throws this error.